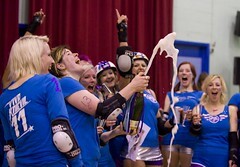 Another visit to the delectable London Rollergirls in sunny (!) Tottenham, and time to test out the Lovely D700 in hgh ISO mode. And time for the lovely but damned heavy 70-200VR to make it’s debut. I think it did rather well, don’t you?